We’d love your help. Let us know what’s wrong with this preview of At Least You're in Tuscany by Jennifer Criswell. 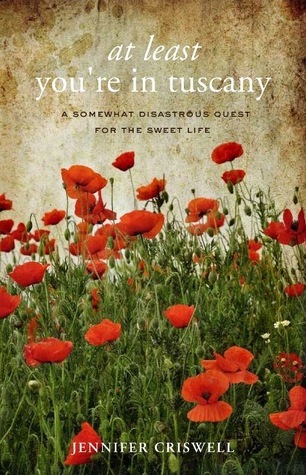 At Least You’re in Tuscany: A Somewhat Diastrous Quest for the Sweet Life is Jennifer Criswell’s memoir about her first year in Montepulciano during which her dream of expat life meets the reality of everyday challenges and results in sometimes funny, often frustrating, always lesson-filled situations. Jennifer Criswell’s move from New York City to Tuscany was not supposed At Least You’re in Tuscany: A Somewhat Diastrous Quest for the Sweet Life is Jennifer Criswell’s memoir about her first year in Montepulciano during which her dream of expat life meets the reality of everyday challenges and results in sometimes funny, often frustrating, always lesson-filled situations. Jennifer Criswell’s move from New York City to Tuscany was not supposed to go like this. She had envisioned lazy mornings sipping espresso while penning a best-selling novel and jovial Sunday group dinners, just like in the movies and books about expatriate life in Italy. But then she met the reality: no work, constant struggles with Italian bureaucracy to claim citizenship through her ancestors, and, perhaps worst of all, becoming the talk of the town after her torrid affair with a local fruit vendor. To ask other readers questions about At Least You're in Tuscany, please sign up. What do you do when you want to make your dream your address, like Marcel Proust; you idolize Italian men; you imagine life on earth should be about all things Italian, and you have “Che palle!” or “Porca miseria!" or “Stronza!” down pat? And what if your mom periodically, okay at least twice a day, yelled "Vaffanculo" at your brother? Yeah, right, you declare your life as a lawyer in New York obsolete; you move to Tuscany - Montepulciano, to be exact - the lock stock and dog way. It is the pla What do you do when you want to make your dream your address, like Marcel Proust; you idolize Italian men; you imagine life on earth should be about all things Italian, and you have “Che palle!” or “Porca miseria!" or “Stronza!” down pat? And what if your mom periodically, okay at least twice a day, yelled "Vaffanculo" at your brother? Yeah, right, you declare your life as a lawyer in New York obsolete; you move to Tuscany - Montepulciano, to be exact - the lock stock and dog way. It is the place you were destined to be, right? Right. And then reality strikes. Warm-blooded Italian men and hot-headed Italian mamas become part of morning coffees and late afternoon hang-outs on a stoop. Talks about food overshadow overworked burocracy, money running out and job-opportunities denied due to the Italian's principles and a stilted use of the language. Life gets tough, winters get more snow than the north pole and still no job, no money. Destiny is suddenly defined by resilience and hope. Optimism and depression become bed mates, while the town ensures that every passionate step will go through the gossip mill.
" I saw myself through the eyes of my closest friends who kept telling me how brave and how adventurous I was. Yes! Look at me! La Regina dell’ Avventura! The Queen of Adventure! But as I learned quickly enough, living a dream is very different from having a dream—and I was about to meet a whole different me along the way." Jennifer Criswell wrote an online journal of her day to day experiences settling in and applying for citizenship in Italy. It is still a delightful blog to follow. This book was born from it. Russel Crowe's movie "A Good Year" had the same enchanting effect on me. It was about an arrogant, narcissistic Brit inheriting a wine farm in France and is forced to get to know the local population on their terms. It is due to this movie that I wanted to read this book. What a better way is there to experience a country than to read a book like this which is much more than a tourist trap, and much nearer to the core than a travel journal. This is the real deal. I looked up the town, Montepulciano, on the internet, but to be honest, I was so not impressed. The expiry date stamped all over it, is just as ancient as the town's history. Dull, dreary and dated. And those hills! Who wants to live in a place where there is no flat street of any kind in sight? But Jennifer brings the town and its people so colorfully to life, I am now more curious than ever! And of course I am going to try all those recipes. Her honesty makes the experience so much more than just a memoir. Nope, I do not want to live there, ever. But I would love to visit and see how she is doing now. She did sell us the idea of bright red poppies scattered everywhere on an otherwise color-devoided landscape. Actually, she introduced all the colors of the rainbow to us through the culture, people, gardens, language and her emotional landscape. Montepulciano it is then. Anyone interested in joining the trip? But do yourself a favor and read this book first. This is a light-read, but an entertaining one. I loved At Least You're in Tuscany. Loved it! I lived in Italy as a kid, a few hours south of Montepulciano. I've been back once (13 years ago as a college student) and I admit I've since had dreams of returning as an expat. Jennifer Criswell acted on her dreams. With no specific plan and no job prospects, she packed up and moved to Italy with her Weimaraner. All of the emotions that come with those first few days in a foreign country came through - I could feel Criswell's exhaustion, pangs of ho I loved At Least You're in Tuscany. Loved it! I lived in Italy as a kid, a few hours south of Montepulciano. I've been back once (13 years ago as a college student) and I admit I've since had dreams of returning as an expat. Jennifer Criswell acted on her dreams. With no specific plan and no job prospects, she packed up and moved to Italy with her Weimaraner. All of the emotions that come with those first few days in a foreign country came through - I could feel Criswell's exhaustion, pangs of homesickness, confusion, awe and excitement as if it were my own. I was moved by her description of how different it is to walk into town as a tourist compared to returning as a resident. She also wonderfully captures the old-world nature of small-town Italian life, how even in the 21st century, many things remain familial and very simple. A couple of things surprised me. First, I didn't realize Tuscans don't like how they were portrayed in Under the Tuscan Sun. Now I want to reread that book - it's been a long time - and keep that perspective in mind. Also, Criswell was told by a fellow expat that it is "impossible to make close friends with the Italians," that you "won't get past the front door." I was completely surprised by this, because it wasn't my experience at all. Criswell's friend Anna does mention that Tuscans are "not like southerners," who tend to get close. And I lived farther south, in the southernmost portion of Lazio. I was in my neighbors' homes all the time. We'd often have dinner together, visit, walk through the garden, play together... it was as if the neighborhood was one huge family, and it started almost as soon as we moved in. When Criswell felt lonely, I couldn't help but feel a bit sad about this difference. Criswell has a talent for vividly describing her experiences, getting all of your senses excited about this Italian adventure (at one point in the book, I was seriously craving prosciutto!). She has also given her readers a very honest picture of what it's like to be an expat in Italy - not only the wonderful experiences you may dream of when you think of moving to a different country, but also the very real challenges of finding employment, learning the language, and trying to fit in with the locals. I often thought about how immigrants here in the States must feel, especially on the language front. Speaking of language, the smattering of Italian throughout the book was just delightful. I speak Italian, and still learned a few new phrases! I remembered having many of the same difficulties she did, especially when trying to understand older Italians, who often speak in their dialect. After throwing down "Under the Tuscan Sun" in utter annoyance, I went in search of an account of an English speaker living Italy that wouldn't bore and annoy me. "At Least You're in Tuscany" was what I was looking for. The author has a great knack for making you care about everyday struggles, and was endearingly self-deprecating, but not overly so. It was the kind of book that made me laugh out loud, and occasionally interrupt my husband to read him a quote. It's just a really fun read. Being an expat myself, I know that the dream of living in a foreign country can often differ pretty significantly from the reality. However, I've never come across a book that captures the trials and tribulations of moving to a new culture with quite the same level of laughing honesty of 'At Least You're In Tuscany'. Criswell's dream of sipping espresso on an Italian balcony while writing best selling novels, overlooking rolling Tuscan hills, is brought crashing down to earth through a series of Being an expat myself, I know that the dream of living in a foreign country can often differ pretty significantly from the reality. However, I've never come across a book that captures the trials and tribulations of moving to a new culture with quite the same level of laughing honesty of 'At Least You're In Tuscany'. Criswell's dream of sipping espresso on an Italian balcony while writing best selling novels, overlooking rolling Tuscan hills, is brought crashing down to earth through a series of hilarious (and occasionally heartbreaking) experiences as real life intervenes. No one tells you that you may well have to wait forever to get citizenship; that you will be required to increasingly ration tinned food as a direct result of the aforementioned citizenship wait (because no one will give you a job); that doing laundry in Europe can sometimes mean risking your life; and that the allure of living in a idyllic Italian town wears off quickly when it turns out the whole town is talking about you. Criswell recounts her tales of triumph and woe with a brutal honesty that is often hilarious - I laughed out loud on a number of occasions. She is such an endearing heroine because she tries so desperately to look on the bright side of an increasingly demoralising series of events, and it is her optimism that eventually brings her out on the other side. I cheered for her as she defiantly faced even the worst experiences with an upbeat 'well, at least you're in Tuscany'. Yes, hitting rock bottom in Tuscany is indeed that bit better than hitting rock bottom anywhere else, and that's why I found Jennifer's story so entertaining. Even after a series of events that would have made any normal person pack their bags and get back on a plane in defeat, Criswell's Tuscan dream never dies. She adapts the dream to realities of life, makes it her own and, to her credit, is still living it. In Jennifer Criswell's At Least You're In Tuscany: A Somewhat Disastrous Quest for the Sweet Life, she describes her first year as an expat in the small town of Montepulciano. Her mantra when things go wrong is "At least you're in Tuscany, at least you're in Tuscany." There are many "Lucy Ricardo" moments from her antics while joining the annual Sangiovese grape harvest in Tuscany, to hanging her laundry in the winter outside and her day turning into an episode called "The Day the Laundry Froze." Leaving her former life as a lawyer in America, she chose to be a writer to deal with the distance between the dream in her brain and the reality of small town life. "I wanted a life in which I didn't have to battle with attorneys who delighted in being antagonistic just for the hell of it. I wanted a life in which I didn't make people cry when I took their depositions," Criswell said. The career change made her wonder about others in her life: "Will they think I'm a failure?" She decides to make herself happy by moving to another continent but it is not an easy path. At one point she says: "Soon they would have to rename the corso 'La Via delle Lacrime Americane,' the Street of American Tears." Criswell recounts, "I learned quickly enough, living a dream is very different from having a dream -- and I was about to meet a whole different me along the way." While many issues are unfinished upon her arrival such as her ability to work in Italy, she moves and continues in her quest for dual Italian/American citizenship. This is going to become one of my favorite books! Jennifer is living my dream right down to living in my favorite Tuscan town! Well written and easy to read, this book quickly takes you on a wonderful (and sometimes bumpy) trip through the first year of the author's new life in Italy. You will enjoy this book! What a wonderful book of perseverance! I likely would have left Tuscany after a couple of months in the conditions Criswell endured. This book also helped to fuel my travel bug. Tuscany is gorgeous, as is most of Italy, and I can't wait to return one day. We all dream of escaping our lives and Jennifer actually did it. A light hearted look inside the story of chucking it all and going for broke to follow your dream. As a young woman, Criswell took an extended trip to Italy and knew she had found her true home. Years and several more visits later, she finally leaves New York and moves to Montepulciano, Tuscany, with her dog Cinder. Despite careful preparation, she hits roadblocks from the start - a rude landlady, social isolation, difficulty speaking Italian, and most of all, serious financial trouble because she can't work. Her Sicilian ancestry entitles her to Italian citizenship, but of course, what was p As a young woman, Criswell took an extended trip to Italy and knew she had found her true home. Years and several more visits later, she finally leaves New York and moves to Montepulciano, Tuscany, with her dog Cinder. Despite careful preparation, she hits roadblocks from the start - a rude landlady, social isolation, difficulty speaking Italian, and most of all, serious financial trouble because she can't work. Her Sicilian ancestry entitles her to Italian citizenship, but of course, what was presented as an easy process takes much longer than anticipated. In the meantime, no one will hire her under the table. Much of this memoir is simply about looking for work in a small town, but Criswell makes it interesting. On the non-work front, she's dismayed to be dumped by old friends in the area, but eventually finds new ones in unexpected places - and has a fling with a charming, classically Italian produce vendor. :) I also loved the stories of the grape and olive harvests she participates in, although I totally believe her that the work is less romantic than it sounds. Tuscany, one of my favorite places to visit. Great fresh food. Scenic views that take your breath away. Winding roads to get lost on. And people who treat you like family. And then there's the wine. It's a great place. Jennifer Criswell chose to move to a small town in one of the hilltowns of Italy: Montepulciano. Her antics come across breezily and with feeling. I will enjoy writing this one up for my blog. Brings back so many memories of our trip to Tuscany. I'm a day dreamer and sometimes think about selling everything and moving someplace foreign. Reading this book has not deterred me so much as provided valuable insight. Living abroad isn't like traveling abroad. I enjoyed reading about every obstacle and every success she experienced in moving to Tuscany to become an Italian citizen. After meeting the author on a wine tour in Montepulciano, I knew I had to read her book. Maybe it's because I fell in love with the town she was writing about, but I found myself wishing the book was longer and wanting more details on her adventures. Lovely tale of the expected (and unexpected) of picking up and moving to Tuscany. I love travel memoirs in general, but I loved this read...as a matter of fact I'm packing my bags for Tuscany as I write this review!! Loved this book. Perfect for any Italophile who wants to be transported to Italy. Many of us dream of packing it all in and going to live in an Italian hilltop village but not many people actually do it. The books I've read to date about it usually evolve around older couples who aren't short of a few euro renovating, cooking and drinking their way through their new lives. Jennifer however is different, a refreshing change from the other sea change books. Her story isn't glamorous - hauling frozen duvets off the clothesline in the middle of the night is far from glamorous - bu Many of us dream of packing it all in and going to live in an Italian hilltop village but not many people actually do it. The books I've read to date about it usually evolve around older couples who aren't short of a few euro renovating, cooking and drinking their way through their new lives. Jennifer however is different, a refreshing change from the other sea change books. Her story isn't glamorous - hauling frozen duvets off the clothesline in the middle of the night is far from glamorous - but she is very honest and often funny. The story shows the good and the bad about moving to the other side of the world short of cash and without a job. She does it well and explores some of the intricacies of being American in an Italian society. I requested this book originally because the cover art was beautiful and the book was about Tuscany. Once I started reading it, and realized it was an actual memoir, I became a little hesitant because there are so many books out there about expats living in Tuscany that the subject matter had become a bit cliché. Or so I thought. I appreciated that Jennifer Criswell’s book didn’t seek to elevate her experience into some sort of extreme life-changing, life-affirming experience that it wasn’t. Too often that angle is overdone. While the author does experience some obstacles, she seems to find her way through them, learning from them as she goes & often times seeing the humor in them, but doesn’t seem to turn them into something more than what they were. I admired that. That's not to say that she didn't change, or grow...most certainly she did. It just wasn't exaggerated. I also appreciated that she wanted to accept Tuscany on its terms, rather than trying to get it to conform to hers. While she was a bit surprised at some of the differences she found between living in NYC and living in Tuscany, she only notes the differences, and then moves on. She begins to realize that she has friendships, they just aren’t the same as the ones she had in NYC, and that’s okay. I appreciated that as well. So often it is easy to go somewhere and think that our way is the right way, but the truth is, it isn’t. It might be a valid way, but it’s not the only way. Finally, I appreciated her determination. There were several times I expected to move into the next chapter and find her flying home in defeat. Instead, she continued to work through her difficulties, using the resources that are available to her. That is all that anyone can do, and it’s what we should all do when trying to make a dream become a reality. Often times, it's easy to look at people who have accomplished a dream, and not see the work it took to get there. So I enjoyed hearing all about her trials and triumphs along the way. I enjoyed watching her relationships with people grow, and seeing how, as people began to understand her, they began to try and help her. Friends gifted her food for Christmas the year money was tight, and people increasingly sought to help her find employment and become “official”. It reveals a universal truth: you want to help those you care about. I have spent some time in the hills of Tuscany, and really enjoyed the descriptions and observations that Jennifer shares with her readers. Many of them were similar to observations I had made, and some of them were new, but it really gave a nice flavor of authenticity to the book, and helped us to understand the people and places in her new life. Often times, when reading memoirs, I expect to find some earth-shattering revelation at the end of the book. But in this case, I was content not to. It would have felt forced. Instead, I was happy to find that she had succeeded in her goals through perseverance and sacrifice, finding new friends and collecting interesting stories along the way. The biggest reason I didn't give it 5 stars was because there was a point about 3/4 of the way through where the story got a bit slow. But in the end, it was worth reading, especially for those who enjoy travel memoirs, or living vicariously through others. I am always attracted to stories of this nature – what would it be like to transplant your life to some exotic destination, such as Tuscany in this case? So when Criswell wrote, “not just picking up roots but planting them in the right spot”, I thought this was a good sign. Not to be. Would you quit your job, pack your bags, and move to another country – alone - where you knew no one close, hardly spoke the language, understood even less, and where your paperwork entitling you to work was not wel I am always attracted to stories of this nature – what would it be like to transplant your life to some exotic destination, such as Tuscany in this case? So when Criswell wrote, “not just picking up roots but planting them in the right spot”, I thought this was a good sign. Not to be. I've loved traveling in Italy and feel Criswell certainly captured many realistic attributes of not only the countryside and culture but also life in a small village. Her long struggle to find work made the book seem to drag on, and I kept reading while feeling increasingly disconnected from her. At first, I thought she was twenty-something, because her decisions seemed like so at times, and therefore I was sympathetic and relating to that, especially her arrival in Tuscany before she even got the final papers for a work permit. But when I discovered she was turning forty, it felt like quite an immature and foolhardy thing to do, to travel all that way without really considering everything necessary to make such an enormous life change. Let’s hope that she likes her new self. I enjoyed this and really want to give it 5 stars, but I feel like something is missing. The writing is nicely done, the account of her move to Italy was great - she tackles equally the up and downsides to her decision to move. I truly expected, as I'm sure others at the time might have, that she'd end up back in NY by the end of the book. I applaud her stubbornness to stick with the dream. I also felt like her explanations of the culture were well done. Instead of a William Sonoma spread with f I enjoyed this and really want to give it 5 stars, but I feel like something is missing. I also felt like her explanations of the culture were well done. Instead of a William Sonoma spread with friends drinking wine under olive trees garnished with twinkle-lights and living la dolce vita, she's candid about the setbacks and learning curve of living in the culture vs. visiting & romanticizing it. What is a bummer about memoirs, though, is that they lack the informality of a blog. They're sometimes careful. She's candid - quite candid, actually - but I still felt like something was just a bit off - like the raw honesty was there lurking, but not allowed to really come forward. When she "got distracted" during the cooking lessons, or shot down an old guy asking for "English Lessons," we got a taste of her humor and I wish we'd had a bit more of it. Some pictures would have been great, as well. Her writing was picturesque enough and wasn't lacking in description, I just wanted them. It's a travel/culture memoir. Lots of pictures would have been wonderful. Edited to add: resource on where to find and/or order the wine as well as the olive oil might be a good addition to the book. I was kind of confused there was discontent about Alberto not helping her more. Why was he obligated to do so? Or was it just mistaken expectations set via crush? Overall, it was an enjoyable read. I was sad to read in her blog that Cinder has since passed away, but impressed she made it to 15 years. From the pictures (in the blog) she was a beautiful dog, and the life in Tuscany seems a lovely way to spend a canine retirement. For some reason, it is an American obsession to visit Italy – live in Italy. It is the topic of several best selling books. Is it the food? The simplicity of life? The history? What draws us in. Through this book, we can live our own dream of visiting Italy vicariously through Jennifer as she gives up her life as a New York lawyer and moves to a rural area in Tuscany. It’s the stuff that books are made of! I must admit, that the title made me think that it was going to be a semi-humorous and mad- For some reason, it is an American obsession to visit Italy – live in Italy. It is the topic of several best selling books. Is it the food? The simplicity of life? The history? What draws us in. Through this book, we can live our own dream of visiting Italy vicariously through Jennifer as she gives up her life as a New York lawyer and moves to a rural area in Tuscany. It’s the stuff that books are made of! I must admit, that the title made me think that it was going to be a semi-humorous and mad-capped adventure with Jennifer meeting up with hilarious situations at every turn. Or I thought perhaps a light-hearted look at the cultural differences between America and Italy and what happens when one decides to immerse themselves in it. Instead, it was a more strait-forward telling of Criswell’s first year in Italy. It was certainly an adventure, but not a lot of humor in it. While I wouldn’t call it disastrous (more challenging), she does a good job of laying out what it takes to make the leap – and that even thinking you are prepared for the leap into the Italian lifestyle doesn’t mean you are ready. It’s baptism by fire made ever more real by language and cultural barriers. Oh and then there is the loneliness…assimilation does not happen overnight. Jennifer is a trooper though and despite some immigration issues that keep her from holding a job, she embraces what she can of the sweet life and keeps pushing forward to make her dreams come true. The story has a few dramatic moments, but mostly is a personal story of the author’s trials along the way. I loved her descriptions of her small town, her comparisons to American life and her determination to continue on her quest. I recommend it for those who think they want to move to Italy and lovers of travel memoirs. Why Read: I’m a fan of travelogues. Enough said. If you know me, you know my tastes in books are extremely wide ranging but at the end of the day: travelogues will always be some of my favorites. Also.. Netgalley. Review: Every once in a while, a book comes along and makes me smile without smiling, and look at myself. I didn’t think it would be this one. In fact, as the book started, I expected the opposite. I had just returned from Italy, and was not maybe in the right mood to read a travelogue Why Read: I’m a fan of travelogues. Enough said. If you know me, you know my tastes in books are extremely wide ranging but at the end of the day: travelogues will always be some of my favorites. Also.. Netgalley. Review: Every once in a while, a book comes along and makes me smile without smiling, and look at myself. I didn’t think it would be this one. In fact, as the book started, I expected the opposite. I had just returned from Italy, and was not maybe in the right mood to read a travelogue about a place I was returning wrong. Thankfully, I was wrong. There’s nothing better than an authentic book. Not only the literary fictions and Fitzgeralds of the bunch, but the ones where you hear the voice of the author and understand them as a person, and not as a storyteller. This book does that. Jennifer, or Jenny as she calls herself in the book, is one of those crazy travelers who does what we all dream of. She moves to Europe, in the Tuscany region to be precise. What follows is a not-so-glamorous account of what can go wrong (and right!) when you risk it all. I found it was full of smiles, happiness and also some horrors. But it really reminded me that if you want to make something work, it’s all up to you. Jenny had help, of course, from her family, friend support group and new acquaintances in Italy. At the end of the day though: it was all her. I couldn’t imagine a better heroine to face the terrors of mold, frozen bedsheets and the hair-pulling stresses of finding a job. And I certainly will be looking for a job before I move outside of the country! My husband and I have both read Jennifer's book after meeting her on a recent trip to Tuscany. We were lucky enough to have a tour at the Poliziano Winery and Jennifer was our guide. We were a group of 6, from the states, celebrating my husband's birthday. We hit it off immediately with Jennifer, and ended up buying 3 copies of her book and having dinner with her in Montepulciano. I could go on about the delightful evening and restaurant, but I will save this for another time. I read "At Least Yo My husband and I have both read Jennifer's book after meeting her on a recent trip to Tuscany. We were lucky enough to have a tour at the Poliziano Winery and Jennifer was our guide. We were a group of 6, from the states, celebrating my husband's birthday. We hit it off immediately with Jennifer, and ended up buying 3 copies of her book and having dinner with her in Montepulciano. I could go on about the delightful evening and restaurant, but I will save this for another time. I read "At Least You're in Tuscany" and could relate to her story because we had spent a week in Tuscany and a couple days in Montepuciano. Her writing style is descriptive, humorous, and truthful. I could picture the town and people, and had fun connecting her journey. She describes her daily routines, and you laugh and cry out loud with her heartfelt situations. The title says it perfectly as she comes across the frustrations of picking up your life and moving to a foreign country. This is a perfect read if you are traveling to Italy, and especially if you plan to visit Tuscany. My husband will rarely read a book, but made a point to start Jennifer's book. He finished it, and was equally entertained with her stories. We both wanted more.....Jennifer mentioned she would hope to write another book on cooking in Italy. Since we had dinner with her, and ate at one of her favorite neighborhood places we can hardly wait for a second book from her. We wish her success and know that you will enjoy her book! This was such an enjoyable book and easy to read. I felt like I was sitting with a girlfriend chatting over a bottle of Pinot Grigio and hearing about her recent move to Italy. Anyone who visits Italy probably has at the very least a fleeting thought of packing up and moving there. This is a story of someone who did just that-packed up and set down roots in a foreign country. But instead of the oh so overdone fairy tale of a young woman who moves to Italy, renovates a Tuscan villa, falls in love This was such an enjoyable book and easy to read. I felt like I was sitting with a girlfriend chatting over a bottle of Pinot Grigio and hearing about her recent move to Italy. Anyone who visits Italy probably has at the very least a fleeting thought of packing up and moving there. This is a story of someone who did just that-packed up and set down roots in a foreign country. But instead of the oh so overdone fairy tale of a young woman who moves to Italy, renovates a Tuscan villa, falls in love and lives happily ever after, this book is a realistic account of what it takes to pack up and move to somewhere where you don't know anyone or even speak the language. How do you learn the language? What do you do for work when your funds get crucially low? How do you navigate the long and convoluted process of gaining citizenship? We don't think about the day to day when we're daydreaming! This book, however, finds complete entertainment in the minutiae of daily life. Jennifer's experience works as a good reminder that the life of an expat isn't always an easy one. And that that which is good comes at a price. Ever since she first traveled to Tuscany, Jennifer felt herself drawn to the people and the place. She knew she had found her "soul country" and was prepared to give up her safe life as a US lawyer to move to Tuscany and become a writer. So far this sounds a lot like "Under the Tuscan Sun", right? But apart from the initial premise, the two books have lit Jennifer's experience works as a good reminder that the life of an expat isn't always an easy one. And that that which is good comes at a price. So far this sounds a lot like "Under the Tuscan Sun", right? But apart from the initial premise, the two books have little else in common. Where "Under the Tuscan Sun" focuses primarily on the Tuscan country side and Italian food, the main focus of "At Least You're In Tuscany" is definitely the more immediate experiences and difficulties related to being an expat -- finding a job, making friends, becoming familiar with the language, being comfortable in a new setting. No matter how much you love visiting a place, moving there 'for good' is always a culture shock, and Jennifer manages to describe this culture shock in a very relateable fashion, without succumbing to self-pity. I'm an American expat living in the UK with a deep love of Italy. This book really spoke to me. I can so emphasize with the struggle Criswell has had to become legal as well as to figure out where in this foreign society she fits. I laughed and I cried along with Criswell. Sometimes I was just grateful that I'd emigrated to a less bureaucratic country. I loved the way Criswell added the Italian language to the book. I felt like I was learning along side her. In fact, due to this book I've signed I'm an American expat living in the UK with a deep love of Italy. This book really spoke to me. I can so emphasize with the struggle Criswell has had to become legal as well as to figure out where in this foreign society she fits. I laughed and I cried along with Criswell. Sometimes I was just grateful that I'd emigrated to a less bureaucratic country. I loved the way Criswell added the Italian language to the book. I felt like I was learning along side her. In fact, due to this book I've signed up for more Italian classes, I had been about to give up. I love these types of books: the ones where someone moves to a different country and the ones where someone tries something new for a year or longer. I find these types of book very interesting and inspiring. I always learn something new, and am inspired to try new things for myself. This book doesn't disappoint. There's no sugar coating. Jennifer had the dream of moving to Tuscany and with some stars in her eyes she takes the leap. Well...turns out life isn't always a fairy tale and she has her s I love these types of books: the ones where someone moves to a different country and the ones where someone tries something new for a year or longer. This book doesn't disappoint. There's no sugar coating. Jennifer had the dream of moving to Tuscany and with some stars in her eyes she takes the leap. Well...turns out life isn't always a fairy tale and she has her share of difficulties along the way. However, she sticks it out and creates a new life for herself. The full title of this books is At Least You're in Tuscany, A Somewhat Disastrous Quest for the Sweet Life. The book is a memoirs about one year in the life of an Italian-American woman who attempts to emigrate to Tuscany, Italy, at the age of thirty-eight-going-on-eighteen, with her elderly dog. To be honest, I found that the litany of bad decisions by the author made me wonder about her sanity. I suspect much of the fun people find in reading this account of a search for the good-life in Italy, The full title of this books is At Least You're in Tuscany, A Somewhat Disastrous Quest for the Sweet Life. The book is a memoirs about one year in the life of an Italian-American woman who attempts to emigrate to Tuscany, Italy, at the age of thirty-eight-going-on-eighteen, with her elderly dog. To be honest, I found that the litany of bad decisions by the author made me wonder about her sanity. I suspect much of the fun people find in reading this account of a search for the good-life in Italy, is a large dose of schadenfreude, taking joy in another person's woes. If it is, I won't spoil it for you. The author's experiences are not unique, but she is very honest about her own failings, and has an amusing, self-deprecating humor. She is a fluid writer, who confidently tells her tale. This is the kind of book you would gift to any friend who says they are going to emigrate it Italy, so they can be forewarned. This book, "At Least You're In Tuscany" is wonderful, hysterically funny and very "relatable", even if you've never BEEN to Tuscany! I haven't laughed out loud so many times reading a book in a very long time. This is a feel-good, honest adventure story that really explains the Italian people of Tuscany, their daily lives, their ways, and how a determined American with "every woman" flaws, makes the small town of Montepulciano her home. Brava! I loved this story, This lady can write, and as an expat in Italy I can really relate to this book. Whilst Jennifer's story is totally different to my own, there are so many times I found myself nodding and understanding what she was dealing with. I also learnt a few things I didn't know about italy, a great book and I now need a follow-up to know what happens next. Criswell recounts her tales of fulfilling her dream of moving to the Tuscan hills. She explains to the reader quite quickly how her idea of what life would be of sipping espresso on an Italian balcony while writing best selling novels and what reality actually was. She had no clue that you may well have to wait forever to get citizenship. As a result no one will hire you and you will be required to ration food from a tin can. The fact that doing laundry in Europe can sometimes be a dangerous past time and when everyone in town is talking about you, the quaintness wears off very quickly. Criswell tells her tales with humor and honesty that has the reader laughing out loud. I found her to be hilarious as she expressed her feelings and adventures. She tried to look on the bright side every time she encountered a demoralizing event. You cheer for her the whole way as she defiantly faced unpleasant experiences with an upbeat 'well, at least you're in Tuscany'. It was a great read and a hilarious look at one woman’s journey to fulfill her dream. I give it a 4 out of 5. My Thoughts On The Book: I thoroughly enjoyed the true story of someone who really wants to fit in and seem like a local in another country. Having traveled a good bit I have often wondered what it would be like to just pick up and move to another country. I think this book is the answer to my ever present question. In order to live in another country you have to learn the language, adapt to the culture and keep on keeping on. The book also shows that it does not take a ton of money to do this. My Thoughts On The Book: I thoroughly enjoyed the true story of someone who really wants to fit in and seem like a local in another country. Having traveled a good bit I have often wondered what it would be like to just pick up and move to another country. I think this book is the answer to my ever present question. In order to live in another country you have to learn the language, adapt to the culture and keep on keeping on. The book also shows that it does not take a ton of money to do this. Who knows maybe someday I will venture out into the world and live somewhere I have never lived before. Reading this book is like sitting down to have coffee with your best friend. Honest, sometimes sad and humorous, I believe she gave an incredible retelling of that first year in Italy. Given some of her experiences, I may have just packed up and headed home. I was an exchange student for a year and let's face it, after a year you are still trying to get your foothold somewhere. The first year can be bad, frankly my first seven months abroad I was homesick. Challenges are abundant in a different c Reading this book is like sitting down to have coffee with your best friend. Honest, sometimes sad and humorous, I believe she gave an incredible retelling of that first year in Italy. Given some of her experiences, I may have just packed up and headed home. I was an exchange student for a year and let's face it, after a year you are still trying to get your foothold somewhere. The first year can be bad, frankly my first seven months abroad I was homesick. Challenges are abundant in a different culture, and like Jennifer Criswell found out, no one really provides that kind of advanced warning. Living abroad is not for the weak of heart. It takes a long time to adjust, but she told the story brilliantly. There were times I laughed out loud until the tears fell, because I have been there and I can relate 100% to the book. Well Ms. Criswell, At Least You're in Tuscany! "It was this trip, during which I learned to say "yes" to every adventure, during which I'd felt romance and trusted my instincts, that convinced me that if I could muster up a little courage, I could chuck my legal briefs and follow my heart. To write. And to write in Italy." Taking the first step in solo travel takes a hell lot of guts...especially so if you're starting over in an entirely new place, with no friends, bad grasp of the native tongue and just your gut instincts to trust. Jennifer Criswell earns my respect - when she finally leaves New York and moves to Montepulciano, Tuscany, with her dog Cinder, she throws herself into the thick of it all, tries it all, makes many memorable mistakes while living it up in Tuscany. In reality, life never comes in pretty packages. Cultural difference and language barriers aside, she meets roadblocks such as terrible landlords, monetary shortages, food crises and many more. Finding new friends and strengths in unexpected places is what makes her experiences worth reading about. It takes a great deal of courage to uproot yourself from the cosmopolitan New York and, accompanied only by an elderly dog, attempt to settle in a Tuscan village and become an Italian. With only a very limited knowledge of the language, but guts in abundance, and some inherited Italian genes, Jennifer is determined to settle in Tuscany and write a best selling novel. This book had its moments, but it really bogged down for me particularly in the second half, and I began to lose interest. Well I certainly didn’t know that it would be so difficult to move to another country and establish oneself! Jennifer had a really tough time making a go of it. She shows us how frustrating it was to wait on the arrival of the proper paperwork and getting through the red tape. We follow her on her adventures as she follows her dream to live in Tuscany. I thought that this was a very relaxing read. You don’t have to think much with this one, just follow along. What is life in Tuscany like? Read t Well I certainly didn’t know that it would be so difficult to move to another country and establish oneself! Jennifer had a really tough time making a go of it. She shows us how frustrating it was to wait on the arrival of the proper paperwork and getting through the red tape. We follow her on her adventures as she follows her dream to live in Tuscany. I thought that this was a very relaxing read. You don’t have to think much with this one, just follow along. What is life in Tuscany like? Read this and find out!!! Jennifer has a good sense of humor and she is not a quitter!! This book was a quick one for me. I wish that I had the guts to do what she did!! I don’t know if I would have made a success out of it!! Great vacation read!! I give this one a 4 out of 5 stars. If you’ve ever wanted to run away to a life in the Tuscan hills pick up a copy of “At Least You’re in Tuscany.” Jennifer Criswell shares the joys and tribulations of her first year establishing residency in Montepulciano with insightful and honest reporting. After ten years of Tuscan holidays, Ianguage lessons and dreams Criswell leaves New York for a permanent life in Italy. She arrives with bravado, optimism, plans to become a writer and her beloved Weimaraner, Cinder. As the dreams turned to If you’ve ever wanted to run away to a life in the Tuscan hills pick up a copy of “At Least You’re in Tuscany.” Jennifer Criswell shares the joys and tribulations of her first year establishing residency in Montepulciano with insightful and honest reporting. After ten years of Tuscan holidays, Ianguage lessons and dreams Criswell leaves New York for a permanent life in Italy. She arrives with bravado, optimism, plans to become a writer and her beloved Weimaraner, Cinder. As the dreams turned to realities Criswell adopts the mantra, “At least you’re in Tuscany.” She soon discoveries that even with the years of lessons her Italian vocabulary requires expansion. Negotiations with a barracuda landlady for her first apartment becomes an initial challenge. But at least she’s in Tuscany, the first steps to her future. Challenges there are. The path to Italian citizenship through her ancestry is required for employment. But first, months of bureaucracy, missing paperwork, and delays as financial resources wane. Slowly Criswell establishes a few social relationships and finds ways to make small amounts of income. There’s a temporary love affair with a married fruit vendor. Challenges faced and met with humor, determination and insight. I felt Criswell offered a truthful recounting of her first Tuscan year. While she wanted to live the dream she didn’t shy away from relating her own foibles and follies as well as her strengths and successes. For the brief time of reading Criswell’s memoir I too joined her in the Tuscan hills.